Happy Book day! The day every book lover looks forward to, so we can add a bajillion books to out already out of control to-read list. Oh, is that just me? I have been trying to get caught up on all the NetGalley books I requested. I got a little trigger happy with the request button so all the books are advanced copies but most should now be available. I am starting a book challenge in January so by then I should be caught up and have a good mix. In case you missed it here is my list of books for that challenge and feel free to join in. Five Stars: Blew me away, made me want to stay up till 3am to finish, would read again and again or I didn’t find anything I would want to change. Three Stars: Okay, didn’t thrill me but didn’t disappoint me either. Two Stars: I almost didn’t finish, it may have irritated or offended me in some way. ** – Item was received from the publisher via NetGalley in exchange for an honest review. I pull no punches though, so you get all my opinions good or bad. NOTE: I may not care for a book or I may love a book and my reactions are based on my experiences and tastes. Please don’t let my opinions deter you if a book really intrigues you, and know all opinions are my own. ** Rescue Me, Maybe – I think I loved this story so much because I identified so much with Jane, I have thought about opening a B&B some day and her thoughts on customers made me chuckle and shake my head yes. Jane loses her husband and her dog within weeks of each other but she misses the dog more. She feels so guilty for feeling this way but her marriage was on the rocks when her husband was diagnosed with cancer, she stuck by him until the end. She has been dreaming of moving back to San Diego where it’s warm but she detours to Arizona to help her Aunt who needs surgery. Along the way she rescues a dog, she is determined she is not keeping this dog. The dog ends up teaching her how to live, let go, and heal. Very inspiring, and even a little romance thrown in with the local handyman. ** Once Kissed – This is new series by Cecy Robson and I was just as impressed. I just love her writing and how she sets up the story. Curran is a Philly cop who feels responsible for his rookie partner getting shot on duty. He is trying to get back to full duty but he is still feeling on the outs with the other cops. His brother gives him a security assignment to protect an intern that is helping take down a crime boss. Little did he know that he shared a one night stand with the intern Tess. Tess has never broken her fathers rules, except for one night with a gorgeous frat boy. She has just a few more months before she finishes law school and can start over. Her life is so structured and Curran is determined to ruffle her feathers. I am looking forward to the next book in the series. ** A Bramble House Christmas – Willa is in great need of a vacation and now that her son is cancer free she is going to enjoy it. Her last hospice patient left her money and asked her to visit the B&B. Finn can’t understand why his father would leave his nurse so much money after only knowing her for 6 weeks. I liked the lead up into the romance, it felt natural and not as rushed. I also really liked te secondary characters. Why this one rated higher than the other Christmas books this month was that it made me what to read the other books in the series to learn their stories. There is a side story of a connection to the town and family who runs the B&B, a little scandal a little mystery. ** How Forever Feels – This is a cute story of friends turned lovers. Maya was devastated when her ex-husband was caught cheating on her. It doesn’t help that he is now marrying the woman she caught him with, and his best friend is in town oversees a project. Her only regret is that she didn’t keep in touch with him. His biggest regret is that he let his best friend have her in the first place. Her best friends are a big support to her and add some comic relief. I really liked the build up and all the characters, it made me want to go back and read the whole series. ** Hidden Bodies – Joe is the charming sociopath that we left in the last book You, having met Amy. She tries to buy books with a stolen credit card. They seem like the perfect couple but when Amy shafts him and leaves him he decides to follow her out to California. The road to finding her again is a rocky one and his obsession is just as fierce and the body count rises around him. Not as good as the first book but still good. 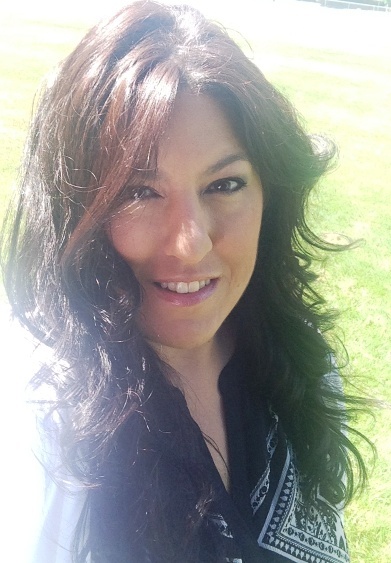 ** The Light of Day – Cora has started her life over after a wild party lifestyle and addiction. Jake can’t see his life without baseball in it but an injury threatens his career. He notices the good parts of Cora and is willing to break down her hard shell. This one dragged a little for me and it felt very similar to other books I’ve read which is why I gave it 3 stars. ** Brother – This book was like a cross from Silence of the Lambs and Wrong Turn. It was brutally violent, and creepy I needed a shower after reading it. A deep lack of remorse, and very peculiar family relationships through the book. Michael feels different from the rest of his family, and he constantly feeds into Rebel’s demands in order to stay in with the family. Alice is a record store clerk and she makes Michael want to run away and be different. Michael’s brother Rebel though will never let that happen. It was more gore than mystery which is why it was just ok for me. ** Nowhere Girl – This book went in so many different directions. It leads you into the world of trafficking, drugs, illegal immigrants and healthcare, and the crazy things a mother would do for her daughter. Ellie is the rebel daughter who wants to have fun, but ends up kidnapped. She has butted heads with her mother who ends up being a suspect. Cate gets pulled into investigating since her daughter just so happens to be friends with the younger sister of Ellie’s. ** Last Chance Christmas – This was a short read, getting into the Christmas spirit. Shea was in an accident leaving her leg in a cast. She goes home to surprise her parents but they have skipped town to warmer weather. Her first love J.C. is in town. He moved away to pursue his hockey career and he is not famous. He volunteers to take her in with the hopes to win her back. Light and quick read but the ending wrapped up a little too quick and tidy. 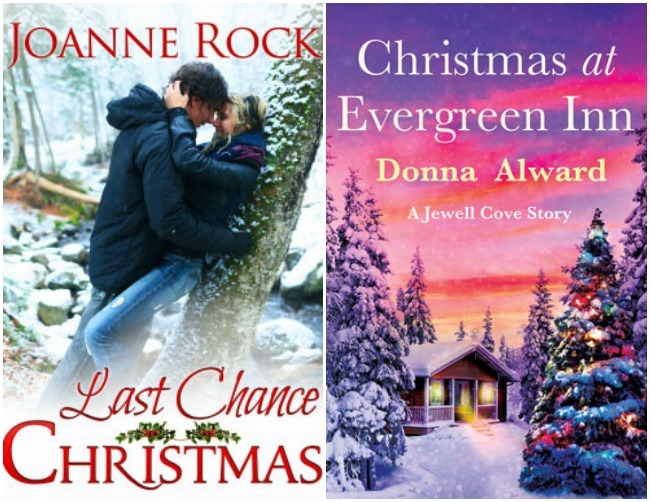 ** Christmas at Evergreen Inn – This was a very short novella in between other stories and I feel it would have been more meaningful has i read the books leading up to this one as I felt the story wasn’t as developed as I would have liked. This was a story of two people who liked each other from afar but neither one told each other. One fateful nights leaves Todd a cop and good samaritan on Lainey’s doorstep. Lainey owns the bed and breakfast and the only free place to stay is on her couch. It was cute, light and fast read but a little underdeveloped. What books have you read this month? Will you add any of these books to your list? 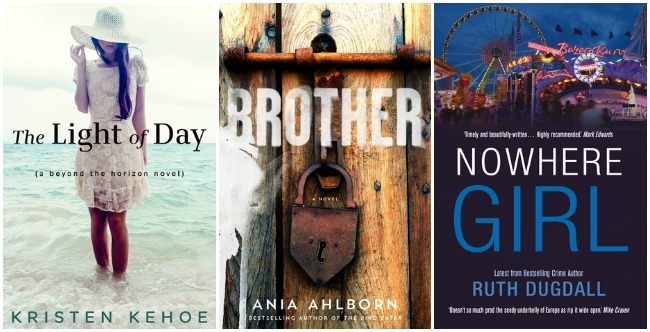 Linking up with Steph and Jana for this months reads. It was a light and fun read and I like that it wasn’t an instant romance it was build as friends first. Yes, I would totally open a B&B. Being able to cook and like in the country, my kinda life. 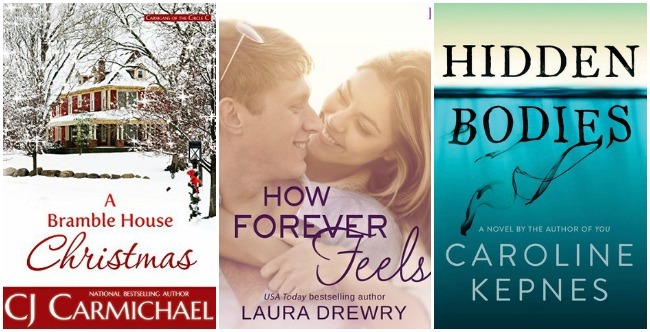 As if I wasn’t getting enough Hallmark movies, I had to read holiday books. Haha! They certainly helped get me in the holiday spirit! glad to see some christmas books on there, even if they weren’t the best. it’s just a fun, light read. i am re-reading holidays on ice, by david sedaris. hilarious. Yes, even a bad one is still good because it is a light upbeat book for the most part. Okay, Brother does not sound good at all! I don’t like creepy books. I get too scared! It was totally creepy and a little strange. Not worth reading if it will creep you out. Ooo Once Kissed sounds good! I love a good romance story! That is such a good romance story and I am looking forward to the rest of the series. I can’t wait to get Hidden Bodies! It was on NetGalley and it was worth it, though less creepy than the first book. rescue me sounds right up my alley. i love a good handyman hahahaha. Haha! I do too. It was less messed up but the body count does continue. His thought process is just interesting, but creepy too. Hidden Bodies sounds interesting, I think it would be hard for her to beat You! Yes, You was better but it was still interesting. It toes the line of will he or won’t he get caught. Very interesting. I agree; Hidden Bodies was not as good as YOU but I’m slightly obsessed with Joe even though he’s a sociopathic lunatic. Yes, for some reason he does have a charm about him but I guess so did a lot of psychopaths from history. I didn’t realize there was a sequel to You. I’ll have to check that out! 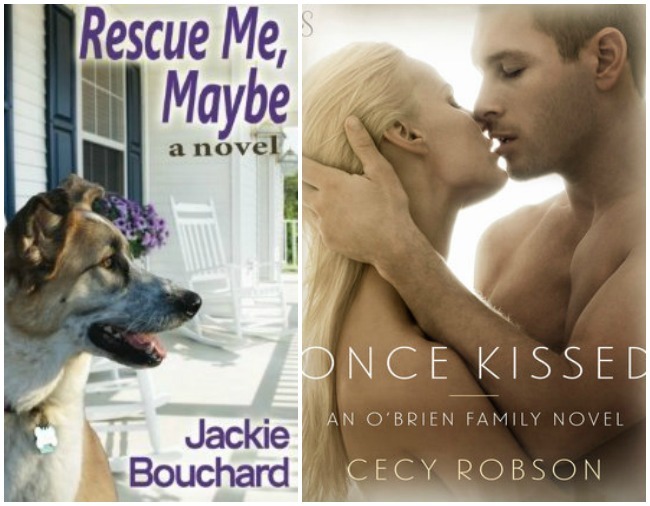 I also added Once Kissed and Rescue Me, Maybe to my TBR list! Yes, it doesn’t come out till early 2016 but I got an advanced copy from NetGalley. Hope you like those two, they were both so good in different ways. great reviews. I have a laundry list of books to get through! This inspires to get my read on! You can never have too many books to read! A little bit each day makes a difference. Bramble House Christmas sounds like something I would enjoy. I’ve been on a Christmas reading kick lately so I’ll have to give this one a try. Light of Day sounds so similar to a book I read this month too called The Beginning of Everything. Maybe I’ll try this one too! Bramble House is worth the read and it made me want to read the others. I think it is worth a read but not in a rush out and get it kinda way. Hidden Bodies sounds so interesting! I’ll have to look into that one! It is interesting to read from the POV of a serial killer but he also has a charm that you want him to turn himself around and not kill anyone. Yes it is as weird as that sounds. Haha! Nothing is wrong with you. I totally love a good creepy book. Very welcome. I am excited to start reading my books. Girl I wish I could read as many books as you do! Totally adding Once Kissed to my reading list. I totally know I would like that book. I totally over committed to some books so I have been trying to get caught up. I hope you like it! It was such a cute read and really made me what to spend my days at a B&B. I don’t know that I could read Rescue Me, Maybe because I don’t do so well with animal books, but it sounds like a great read! I’ve had a couple of people recommend You, so I think that if I like that Hidden Bodies will definitely a book I’ll have to read! It wasn’t overly drawn out or sad and she does rescue another dog that gets a loving home. You is super creepy but totally worth a read. I haven’t heard of any of these, but the majority of them sound like the kind of books I would fly through! That probably means I should make my to-read list longer! I am going to add Rescue Me and Once Kissed to my list! I loved How Forever Feels and The Light of Day was cute too but you are right…it is similar to some other story lines. I need to read You! I hope you like both of them. Yes you need to read You! It was creepy but so good! The cheesy is the best part. I read Christmas in Vermont which was very cute! That rescue me, maybe book seems like something I would really love. My MIL always talks about opening a B&B.. maybe iwill need to look into it for her as a gift! That would be a great book for her. It really sparked the desire to own a B&B. I’m glad Hidden Bodies was still a solid 4 star book for you. I’ve been looking forward to reading it since I finished You earlier this year. I have a couple of other Ania Ahlborn books on my “To Read” list, but I skipped over this one specifically because I have a bad feeling it makes people from West Virginia look really (insert some sort of awful stereotype here). I grew up in WV and I hate the fact that most books and movies set in that area make it seem, well, I probably don’t even need to say it. I just can’t with that. Nowhere Girl is often recommended by Goodreads based on the books I’ve read and rated, so I think I’ll add it to my list. I wasn’t sure about it, but 3 stars is a decent rating. And who knows? I may even like it more than you did. Hidden Bodies was still really good it’s just You is hard to top. It was very backwoods in the surrounds but I didn’t connect it to WV in my head when I was reading it. Though I know what you mean. I think it was an interesting book and maybe if I really the others in the series I would feel more connected to the story, it just seemed unfinished if that makes sense. I say try it anyways. Yay for books! I’ll add some of these to my list. I’m currently reading Pretty Girls by Karen Slaughter. I have Pretty Girls on my list to read. Hope you are enjoying it, I hear it is gruesome. I hear you. I love these post but my TBR list is so ridiculously long it isn’t even funny. And I know I’ll add more. But I love all the suggestions. I will always add more! Haha! I want to read Hidden Bodies! I really liked the character of Joe. Bummer it wasn’t as good as the first, though! Yeah it was still decent but I felt more on the edge of my seat with You, but it still had the same charm and inner monologues that were entertaining. They were cutsies just not over the top. Hope you get some more reading time in! Kerry has read 10 books toward her goal of 85 books.